As most of you know, I'm new to the blogging world and I've been trying to make my blog look more professional since I first started. I wasn't happy with my original layout as it didn't look professional or sleek, so I did some research and decided to purchase a blogger template from PIPDIG. PIPDIG are a company that sells blog templates for both wordpress and blogger platforms. They are so affordable and the designs are professional and mature looking. I am serious about making my blog a long term hobby and so I decided it was time to invest. I wanted my blog to look simplistic but sophisticated at the same time and in the end I chose to go with the "Viva Viva" template, which I absolutely LOVE! The process of buying the template and installing it was quick and easy, as soon as my money had cleared, I received an email asking if I wanted to download and install the template myself or have this done for me for no extra cost. Obviously I opted for the option to have my template installed and within 24 hours I had a beautiful new Blog. 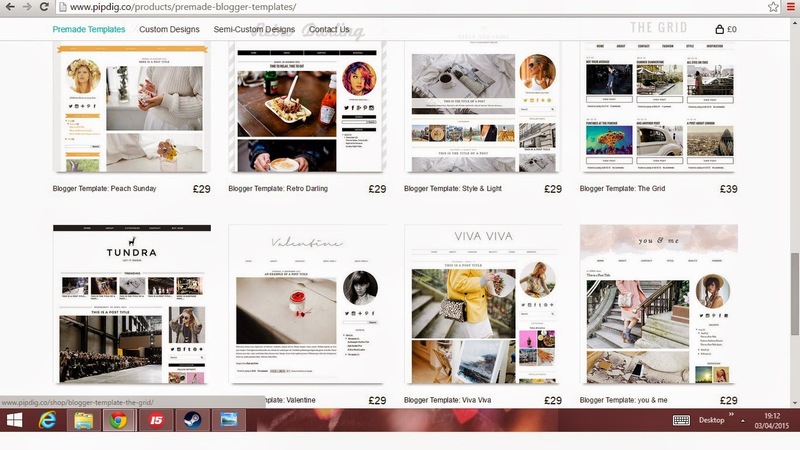 The template is easy to manage and you have the option to change things using the normal blogger layout options. PIPDIG were so helpful and have assured me that they are there to help if I ever need any more advice or assistance with my blog. I would highly recommend choosing to buy your blogger templates with PIPDIG, I know that if I ever want to update my site again in the future, I'll be sure to go back to them.